Why Do You Need Ceramic Coating For? Every driver will agree that it’s pretty hard to maintain the car paint unaffected. That’s why, some automobile owners prefer to apply automotive wax as soon as they acquire their vehicle. As wax may disappear, it’s important to apply the wax regularly in order to provide the best protection for the vehicle. This method has already proved its efficiency and is pretty popular. 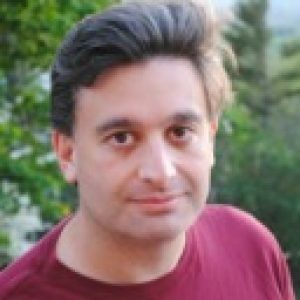 However, technologies develop very fast. Modern automotive paints differ from the ones used before. Before, the color pigment was piled layer upon layer to make the car shining, but now, a clear top coat is utilized for the gloss effect. However, wax remains far-famed. Lately, ceramic coating was introduced to the market. Being produced by several companies, this product deals with paint protection. Starting from 1990s, ceramic coating has been widely employed for enhancing the motor output. But its paint protective features were revealed not so long ago. Just like the product, utilized for engines, the ceramic coating deals with mounting on a microscopic level in order to save the paint from a number of external factors, including road dust, smog, rain, wind, extreme temperatures as well as accidental scuffing against various objects (for instance, clothes). It’s an American product, which is immensely shining. This paint sealant protects from ultraviolet impact as well as from water sheeting. The covering is very enduring and its major plus is that besides its direct functions, it also deals with protection from contaminants, which can spoil the paint. The manufacturer claims that this coating will shield your automobile from the impact of sun rays, rain, bird droppings and debris for up to one year. It’s quite easy to apply this Migliore product no matter if you are a professional or have no experience in this sphere. Moreover, is ensures self-cleaning effect, reducing your visits to a car wash and making the vehicle glossy for longer period. This ceramic paint coating has nothing to do with classic wax or sealant as its functions are much versatile. Between washes, it will keep your automobile clean pretty long. No wax or sealer provides such a long-lasting effect. This covering was developed by Don Havourd, a founder of the Migliore Luxury Car Care Company. Havourd aspired to generate a product, which would grant a decent level of protection to any automobile and, at the same time, would demand no special skills for applying it. After the successful launch of this Strata coating, it became pretty popular among car owners around the world thanks to its user-friendliness and visible results. Color N coating will make your automobile look perfect for a pretty long period. After applying it, your vehicle will look shining and beautiful. This product performs its functions very well, protecting the car from scratches, iron powder, stone chips, ultraviolet light plus bird droppings. 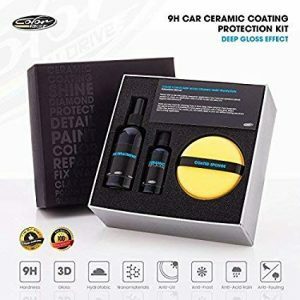 Utilizing 9H Nanotechnology, this kit increases the durability of the car paint. The manufacturer claims that the product is able to ensure the best protection for up to five years with no additional maintenance required. The hydrophobic nature of this sealant helps to provide the decent level of protection even after multiple car washes. Actually, it’s believed to remain unaffected after 100-150 washes. One more advantage of the Color N coating is that it’s easily applied and only one layer of the product is necessary. Each kit contains 2 bottles: the one is for covering the vehicle while the other is additional (in case you need to polish another automobile). 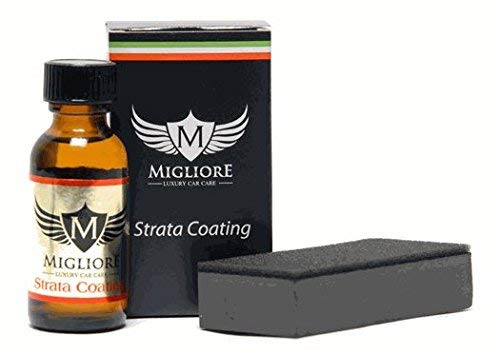 Besides, the kit comprises a sponge, which will assist you in applying the layer of coating evenly and prevent you from scratching the paint accidentally. It is a professional ceramic coating item, which is adored by many car owners. Its innovative formula is widely employed by professionals from different corners of the world. It protects the car along with increasing endurance of the paint. Being absolutely easy in use, the CarPro coating guarantees efficient protection and glossy effect for longer period than a great number of its rivals. Good news: in order to cover your automobile with this coating, you don’t need any special tools or skills. 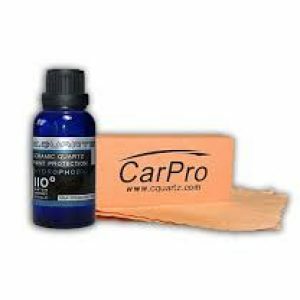 Thanks to its superior fast action formula with 70% of quartz, the CarPro item makes your automobile less prone to damages after bird dropping as well as shields from rain, stains, and extreme temperatures. Every kit consists of an applicator, 5 suede microfiber cloths and rear view mirror hanger (optional). Are you seeking for the product, which will be able to protect the surface of your automobile, granting brilliant shining? 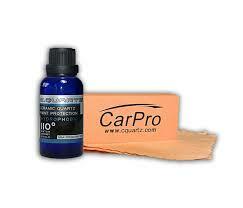 Have a look at CarPro spray, which will save the car’s paint from dirt as well as a number of other possible harms. Good news is that this item is suitable for all types of surfaces, including plastic, rubber and glass. Though, the product was initially created for ultraviolet protection, it has already reached great reputation as an efficient sealant with many other functions. Thanks to its water and dirt protective characteristics, this spray is considered as one of the top products of the CarPro brand along with Cquartz and Gliss items. This ceramic paint coating is chosen by both professionals and simple car enthusiasts, who seek for the best solutions for keeping the car shining pretty long. It can be applied on dry as well as wet surface. 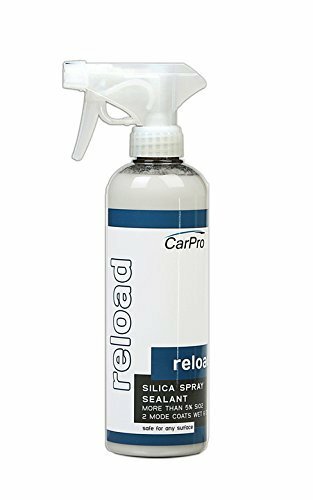 If the car features some water spots, this product removes them with no efforts plus covers the car with a transparent layer of protective spray. If you apply the product on dry surface, this coating grants the perfect shining. Gtechniq C1 is a coating featuring nano-active elements, which covers the car paint to grant efficient protection. Keeping the non-porous structure, this sealant serves as a medium between your vehicle’s surface and potentially harmful objects, ensuring exceptional shining and durable protection. This product can serve 10 times longer than the coatings applied by dealers. The car remains glossy pretty long in addition to being safe from scratches, water, dirt, ultraviolet influence. Moreover, it keeps self-cleaning functions. The item differs from its rivals by its tight bond to the paint. In fact, it turns into an integral part of the vehicle’s surface, lending its molecules to the paint and making it stronger. Consequently, it’s able to grant maximum protection. This Gtechniq Crystal Lacquer utilizes its sub-micron crystalline film for marring prevention plus wash-induced swirl marks. Being tested along with a number of other waxes and sealants, this item proved to be more efficient, resulting in 50% less marring. Furthermore, after applying this coating, it gets much easier to keep the automobile clean as it reduces the impact of water and dirt. To the date, this pair of products turns out to be the most efficient one. Initially, the surface gets covered with Crystal Serum Light and later, Gtechniq EXO serves as an additional coating. Being a consumer variation of Gtechniq Accredited Detailer, this coating is so tough that you can hardly take it off. Actually, it can be removed only with the help of 1,500 grit sand paper. That’s why, this sealant demands special treatment while being applied in order to prevent any mistakes. Simultaneously, this product is rather durable and may provide decent protection for about 3-5 years. Actually, it’s the most efficient sealant, which is allowed to be used by non-professionals. The Crystal Serum Light allows top quality of work no matter if you apply it to increase the car shining, surface slickness or seek for efficient protection from water and contaminants. The item is the perfect choice for drivers, who spend much time on the road and have no time to wash their vehicle too often, as it grants long-lasting gloss. Meanwhile, professionals prefer to utilize the coating and often recommend it to their clients. The item can be used alone as well as in combination with other products. Besides, it can cover the car with one as well as several layers of protection. Bear in mind that the maximum efficiency will be achieved only if you employ this item properly. If applied improperly, you can get rid of the coating using a machine polisher. However, it’s better to do the things right from the beginning in order to avoid extra expenditures. 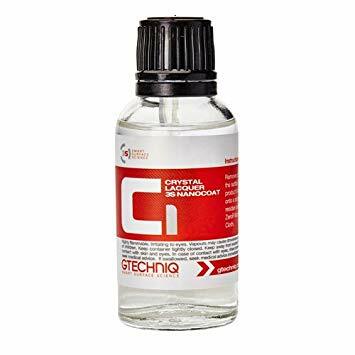 This Gtechniq product creates a bond with the car surface and makes it really strong. Before applying the item, read the manufacturer’s instructions or even consult professionals if you have some doubts. Remember that you can also use Gtechniq C1 and EXO coatings as alternatives. This item is liked by many car enthusiasts due to its extremely easy application. At the same time, the product ensures efficient protection and incredible gloss of the automobile surface. If you seek for the maximum level of protection, you are free to use EXO as an upper layer above Gtechniq Serum Light. The combination of these two items is an exceptional finish against water and dirt. This sealant is compatible with various substrates, among which are paint, gel coat, stone, metal, fabric and Perspex. Being created from modern inorganic-organic hybrid materials, it maintains the great look of a car, boat or plane for longer period. And it demands no special skills or much effort from you to apply it. The product is sold in a foil pack, which also contains nitrile gloves plus micro suede application cloth (20x20cm). The effect of this sealant can last for 1.5-2.5 years. The cure time is three hours. Also, note that the item can be stored for 12 months. If you still contemplate if to apply ceramic coating to your vehicle or not, have a look at the following reasons to say “yes” to it. It provides a great level of protection. No driver wants to have an automobile, looking faded and too old. However, car paint will fade away with time and the only thing you can do to increase its shining days is to provide the surface with special care. And ceramic covering turns out to be a really great solution of that problem as it will make your vehicle glossy and shining for longer period. The sealant is transparent and so, it will deal with shield and conservation of the paint without changing its color. While the nano-sealer will create a protective layer on your automobile’s surface, the ceramic coating will connect its molecules with the ones of paint to give a visible result. Though you will make the structure of the vehicle’s surface more complicated, everyone will see just a flawless surface with no marks of any work done. Moreover, the paint will become more resistant to water and dirt. It demands no special care. If you have ever dealt with wax, you know that it’s necessary to apply it regularly in order to grant a decent level of protection. That’s because wax is gradually washed away. You won’t face such troubles with ceramic coating as its effect is long-lasting and you need to apply it only once. You get a fresh-looking car. You can reduce the visual age of your car by adding some shining to it with the ceramic covering. The surface will look more qualitative plus the car paint will be safe from fading or peeling off. So, if you aspire to maintain your automobile’s good look, it’s advisable to employ the ceramic finish. Andrew is our top-rated author since 2019. He’s a big car enthusiast and customisation pro, who knows how to get more performance from your car. Ask your questions in comment box down below this article.